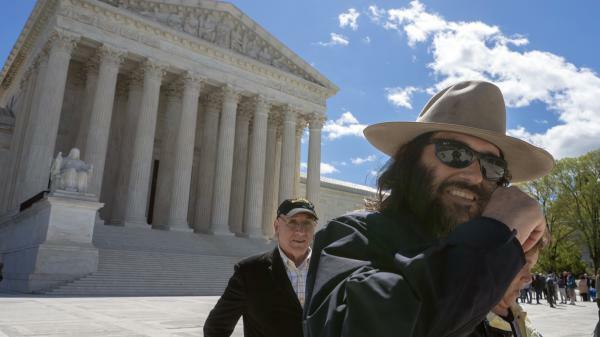 Los Angeles artist Erik Brunetti, the founder of the streetwear clothing company "FUCT," leaves the Supreme Court after his trademark case was argued on Monday. Dirty words only make it to the Supreme Court occasionally. One of those occasions came Monday, in a case involving a clothing line, named "FUCT." The issue is whether the U.S. Patent and Trademark Office acted unconstitutionally when it refused to grant trademark protection to the brand name. And, for the justices, the immediate problem was how to discuss the the F-word without actually saying it. The "FUCT" clothing line, created by designer Eric Brunetti, is mainly hoodies, loose pants, shorts and T-shirts, all with the brand name prominently displayed. Brunetti opened the line in 1990, aimed at 20-somethings, and he's been trying to get the brand trademarked ever since. "Go to eBay, and you'll see a lot of counterfeits, or go to Amazon, and you'll see lots of counterfeits," he said, noting that the knockoffs are costing him real money. If he could get his brand trademarked, he could go after the copycats and shut them down. The U.S. government Patent and Trademark Office, however, has consistently rejected his trademark application, contending that those letters, "FUCT," violate the federal statute that bars trademark protection for "immoral," "shocking," "offensive" and "scandalous" words. Brunetti's case got a boost two years ago when the Supreme Court ruled that an Asian-American band calling itself "The Slants" could not be denied trademark protection. The trademark office had turned the band down, because it deemed the name racially "disparaging," but the court said the denial amounted to unconstitutional viewpoint discrimination. Dealing with the brand name "FUCT" proved a bit more daunting in the Supreme Court chamber Monday. Deputy Solicitor General Malcolm Stewart referred to the brand name as a "profane past participle form of a well-known word of profanity and perhaps the paradigmatic word of profanity in our language." The government, he maintained, can deny trademark protection for that word. The justices pointed to a chart showing which terms had been granted trademarks by the government, and which ones had not. Most of the names on the chart — those granted and not granted — are not suitable for a general audience. Suffice to say that while "FUCT" did not win trademark approval, "FCUK" did, and so did the well-known brand "FUBAR." The word "crap" was registered in a trademarked name 70 times, but the S-word was consistently denied. That prompted Justice Ruth Bader Ginsburg to ask how the trademark office defines what is scandalous, shocking or offensive? And, Ginsburg also inquired, do 20-year-olds generally find "FUCT" to be shocking or scandalous? Probably not, conceded the government's Stewart. But he said the term would still be shocking or offensive to a substantial segment of the population. Thus, it can be denied trademark registration, he argued. Justice Neil Gorsuch pointed to the chart, declaring that it was hard to see why certain trademarks either using or alluding to profanity were approved and others denied. Justice Samuel Alito asked what would happen when "really dirty words" were at issue. How about "racial slurs"? asked Justice Stephen Breyer, adding those are more like "swear words," as they are insults that sting and are remembered by those who are targeted. Stewart replied that because of the court's decision in the "Slants" case, most trademarks with racial slurs are now approved. But, as for the most offensive slur, the N-word, for now, he said, it is still not approved. Representing "FUCT" designer Brunetti, lawyer John Sommer didn't have an easy time either. Justice Breyer had this question: why doesn't the government have the right to say, in essence, "You can use this language in your brand name, but the government doesn't want to be associated with it by granting trademark protection?" "What I'm worried about," said Breyer, is that if a racial slur is trademarked, it will appear as a product name "on every bus where it's advertised" and on newsstands where children and others will see it. "That's not the audience Mr. Brunetti is appealing to," Sommer replied. Chief Justice John Roberts interjected. "But that may not be the only audience he reaches," he noted. At the end of his argument, Sommer returned to the language of the statute, arguing that if "offensiveness" is the standard for turning down a trademark, "Steak 'n Shake" can't be registered either, because "a substantial portion of Americans believe that eating beef is immoral." A decision in the case is expected by summer.